There are some beautiful walks in Puerto Pollensa, and today we would like to inform you about the walk to Cala Boquer, one of the most popular walks in the area. The trip to Cala Bóquer is simple, convenient and easy. As we walk through the valley towards the cove we can visit an old lime kiln, the Font Sementer and the talayotic village; enjoy watching the impressive Serra del Cavall Bernat (with l’ull de bou) and the Serra d’Albercutx. And once in the cove recreated with a magnificent panoramic view. Cala Bóquer is a virgin creek of boulders and gravels, formed by a wild inlet of the sea that is introduced about 300 meters inland. From the beach we can see in the distance the island of Colomer and behind Pal Formentor. On the left side of the cove there is an “escar”, a construction on the seashore that serve to keep the boats and fishing implements used by fishermen. Why is it worth walking to Cala Boquer? 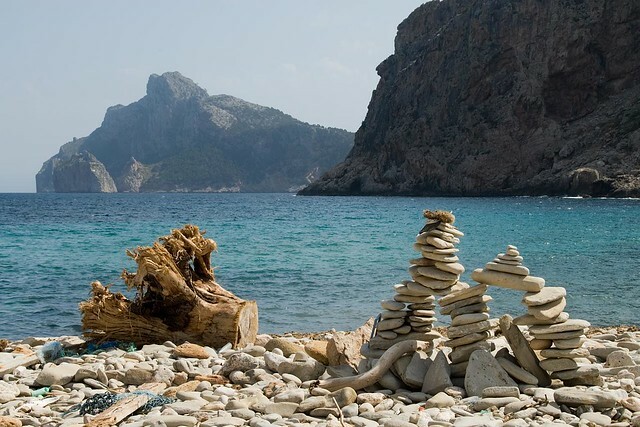 The north of Mallorca and Formentor area know many little bays you can only reach by feet. Cala Boquer is one of them. The way takes you through the hills and mountain where you can enjoy the quietness until you reach the unique little beach of Cala Boquer. Be prepared to walk through the middle of nowhere and get to a little paradise as destination. How long does the walk take? The walk takes about an hour to the beach and an hour back to Puerto Pollensa. With children or without? Ideal for pensioners? The walk is not recommendable for little children, neither for pensioners but depending on their condition. Have in mind this way is not a normal path, the way gets a little rough at some point and you may have to climb a little bit sometimes. Where does the walk start? The walk to Cala Boquer starts from the back of Puerto Pollensa where are signs posted. A map of the village will show you exactly where to start from. The start of the walk to Cala Boquer is about 10 minutes away by feet from the center of Puerto Pollensa. There were the walk starts, you can easily park your car as there is a free parking. Some advices for this walk? Bring water, food and a camera. Views are stunning. There are facilities for having a drink or food. Walking shoes are recommendable and if you like you can have a swim from the beach in Cala Boquer, in that case don´t forget your swimsuit and a towel. The walk starts off quite easy, make your way through the country side and get in to the hills and mountain. 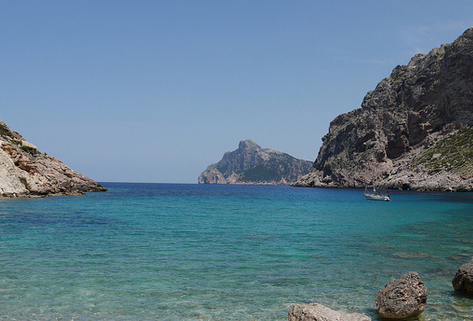 Cala Boquer offers you a total rest, away from everyone and everything. 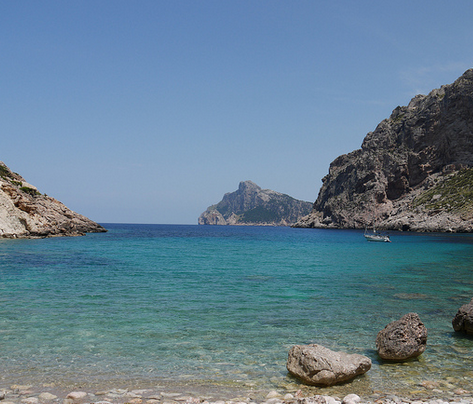 Cala Boquer is a popular walk, it is never busy there but you may find some more sporty types on the way. The way is clear to follow, but gets a bit rougher later. Loose stones and little rocks you will find on the way. Be careful, but don´t forget to enjoy the beautiful views which you have around you all the time. At the end of this experience you will be rewarded with a breathtaking little beach, admire the clear blue sea and relax completely. Stay as long as you like and follow the same way back to Puerto Pollensa. The tour can start at the bus stop of Port de Pollença, located on Passeig Saralegui. Way down the Passeig Anglada Camarasa, to bind to the Passeig Vora Mar. Arriving at the height of Bocchoris Avingua, continue along this avenue until you reach the roundabout at the Port road Pollença / Formentor. Cross the roundabout and take the path of R6 – Cala Bóquer. After a few minutes I reach the gate that leads to the houses of possession of Bóquer, which crossed through a door on your left side..
Leave the houses flanking a barrier and take a cemented track that goes downhill in his first meters. The road runs along the Penyal Roig to enter the Vall de Bóquer. A few minutes later there is a narrow passage delimited by large rocks, and where you can see a stone bench. Shortly after meeting a dry wall behind a lime kiln. The step is also a point of reference to locate the trails that lead to the talayotic village and the Serra d’Albercutx. 500 meters after the step turn right to visit the Font del Sementer. It is a source of mine made of dry stone .After visiting the source turn to the Coll des Moro. From the coll you can see the “Ull de bou” and enjoy a magnificent view of the valley and the creek. In the Coll des Moro there is a crossroads. 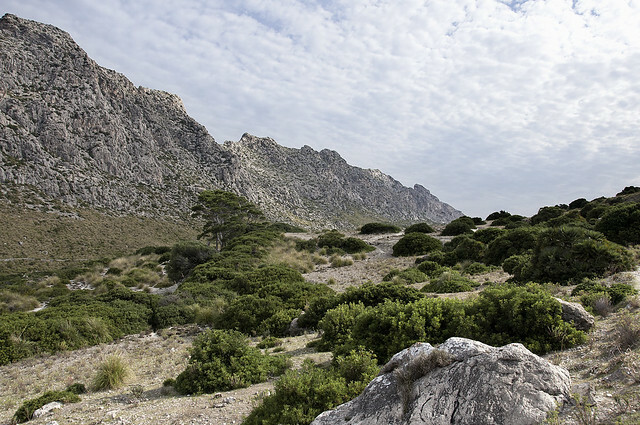 In addition to the path that leads to the Sierra del Cavall Bernat, there are several paths that lead to the Cala Bóquer. Take the path on the far right side of bordering creek that is marked with cairns scattered. After a few minutes, at the junction (Cr) miss the turnoff to the left leading to the creek and continue until the path is lost. Return to the intersection to address the creek helped by a marked trail from time to time with milestones. From the coll is the best way down to the cove, by the panoramic views offered by the lower slope of the land and because it is less slippery with wet floor. After visiting the creek back to Coll des Moro, along a path downhill all the way marked with milestones, which are of great help because of the many trails there. Once in the coll walk a stretch of the road leading to the Cavall Bernat to return back to it. Incredible views,well worth about 3 hour hike (ok for beginners) but if you are walking in the summer,make sure you wear enough sun protection as it can get a lot hotter than in town.the walk is worth the views and the final destination which is the little secluded beach where you can have a refreshing swim. the day we walked through the valley,was the best day of our hols (minus the sun burn).Ask at your hotel for a map how to get to Cala Boquer!Strongly recommend! !